Can you imagine or fathom that? Yes! 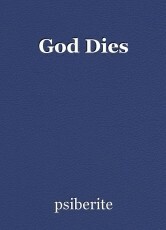 God dies! When the floods pillaged the temple, God was over thrown and there God lay covered with grime. What a nasty bitter end to God.